We provide free on-site cost quotes to homeowners throughout our Pennsylvania service area, including Du Bois, State College, Altoona, Saint Marys, Bellefonte, surrounding areas such as Tyrone, Port Matilda, Kersey, Brockway, Ridgway, Pennsylvania Furnace, and nearby. At Bowman Masonry & Waterproofing, we have many products that can collect this water from the walls and redirect it to your below-floor drain -- including our FlexiSpan® Wall Crack System, and our WellDuct® Window Drain. 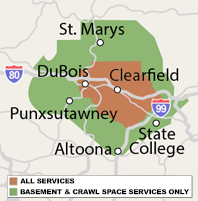 Our Pennsylvania service area includes Altoona, State College, Bellefonte, Du Bois, Saint Marys, nearby Tyrone, Port Matilda, Kersey, Brockway, Ridgway, Pennsylvania Furnace, and the surrounding area. Don't wait to transform your basement into dry, usable space! Contact us by phone or e-mail today to get started!